Cadbury, that vaunted king of British confectionaries, has finally lost a court battle to trademark the signature shade of purple that it has used in its packaging since World War I. Last week, a British Court struck down their patent attempt, declaring that “the mark … lacks the required clarity, precision, self-containment, durability, and objectivity to qualify for registration” as a trademark. 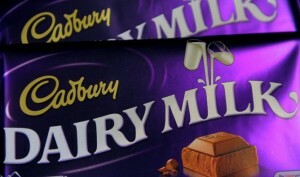 Cadbury sued Nestle five years ago over its use of a distinctive shade of purple – Pantone 2685C, to be exact – claiming that its chief rival was piggybacking off Cadbury’s legendary brand recognition. They won that initial lawsuit, but Nestle ultimately prevailed in the appeals courts. This isn’t the first time a brand has gone to the mattresses over its color scheme: last year, the luxury shoemaker Louboutin tried – and failed – to register a US trademark for the color red featured on its iconic shoe soles. In both cases, judges concluded that trademarking a specific color would amount to an arbitrary, anticompetitive advantage. They did not, however, rule out the general notion of trademarking a color, only that Cadbury’s use of Pantone 2685C was too vague to justify sole commercial ownership of the shade. Even so, the Cadbury decision doesn’t bode well for companies looking to trademark colors in the future. It’s always been a complicated area, but now judges are focusing intently on whether or not consumers can easily associate a specific shade with a brand. If that connection is at all ambiguous, companies like Cadbury will have no choice but to duke it out with their competitors the old-fashioned way: out in the marketplace. Great post! Really caught my attention. Thanks for sharing .